Paris Charles de Gaulle airport has two oneworld lounges: an American Airlines Admirals Club and a Cathay Pacific lounge. Both are located between Terminals 2A and 2C. The Admirals Club at CDG is the best and nicest Admirals Club I’ve been to. And that’s comparing to lounges like the one in Narita and the Flagship lounges. The club has a nice space that’s well decorated and designed. There’s plenty of seating, universal power outlets, and large windows where you can some natural light and nice views of airplanes. The food selection is also great for an Admirals Club. This club is only open in the mornings (6am to 12pm), but they have a great breakfast spread. They have all of the typical American-ish hot items (e.g., omelets, frittatas, eggs, bacon, sausage, potatoes, tomatoes), as well as a good cold selection of breads, salads, meats, and cheeses. Food seemed to be replenished relatively frequently, so things seemed fresh. I didn’t stick around too long in this club because I also wanted to check out the Cathay Pacific lounge next door, but the Admirals Club wasn’t too crowded just before 11am (which was right after a bank of flights had just departed). The two lounges are literally right next to each other, so you can take your pick, but I’d probably choose the Admirals Club for breakfast and the Cathay Pacific lounge for lunch. The Cathay Pacific lounge is also probably a tad less crowded in the mornings. This entry was posted in American, Lounge Reviews, Travel, Trip Reports and tagged admirals club, airport lounge, american airlines, cdg, lounge review, travel, trip report on December 19, 2016 by Edward. Moving makes me feel stupid. I don’t do it very often, so when the occasion does come around, I don’t really know what to do. But it seems like one of those things where someone who optimizes can potentially save a lot of time or hassle, but it’s unclear how much time to invest researching things since it’s a rare event. So I’m moving soon and was looking into transporting my stuff. I don’t have that many belongings, but I am not yet at the point where I can throw all of my material belongings into a carry-on bag (although I do feel perfectly comfortable living out of a carry-on essentially indefinitely). I briefly looked into shipping boxes, but then I wondered what exactly my checked baggage allowance was as an Executive Platinum flyer on American Airlines. It turns out that Executive Platinums, oneworld Emerald members, and First and Business class passengers all get three checked bags for free, each weighing up to 70 pounds. That’s up to 210 pounds of free shipping! It turns out that this isn’t that unusual as Delta and United provide the same checked baggage allowances to their top-tier elites and premium cabin passengers, but it was news to me since I try to avoid checking bags whenever possible. Granted, there’s still the business of hauling 210 pounds of checked baggage (not including your carry-on baggage) to/from the airport, but it’s a potentially useful benefit every once in a while. This entry was posted in American and tagged american airlines, checked baggage, executive platinum benefits on May 2, 2015 by Edward. UPDATE: This contest is now over. Thanks for entering! To kick off my week being a featured blogger, I’m giving away one American Airlines systemwide upgrade! This can be used to upgrade any one-way flight (up to 3 segments) in any fare class, but be warned that international flights can be hard to upgrade (e.g. DFW-HKG), and some upgrades can trigger additional taxes/fees (e.g. LHR). The flights must be marketed and operated by AA to be upgraded. The SWU expires February 28, 2015, so your flight needs to happen on or before that date to be eligible. The giveaway will end at some point before I stop being a featured blogger, so ideally, your flight occurs after February 8, 2015 as well. To enter to win, all you need to do is comment on this post with something you’re grateful for (e.g. “I’m grateful for the wonderful information provided in this blog!” but something that’s actually true and not inane). You can comment as many times as you wish, provided that you list out a separate thing that you’re grateful for in each comment. I will randomly select one comment as the winner. Note that I reserve the right to delete/make ineligible comments that I believe are nonsensical (e.g. “Blejiooisa”) or otherwise not something that anyone should be grateful for (e.g. “I am grateful for ISIS”). All of us who participate in this hobby have so much to be grateful for, and I hope that this giveaway helps us cultivate gratitude just a little bit more. This entry was posted in American and tagged aa, giveaway, gratitude, swu on February 2, 2015 by Edward. I flew business class on this segment not because I applied a systemwide upgrade, but because I got an elusive operational upgrade. Economy was heavily oversold (and extremely light on the flight from DFW to PVG such that I had an entire row of seats to myself in coach), and a ton of people got op-ups. Actually, I almost didn’t get the op-up. They called my name and gave me a new boarding pass, but then they called my name again to tell me that they couldn’t give me an op-up because I had pre-ordered a special meal (VGML), and they couldn’t feed that meal to a different passenger, so they had to give my seat to someone else. I was not particularly happy about that, so I pulled a little bit of a DYKWIA and asked if they could just call catering to ask if they could cater an additional economy meal and let me have my upgrade (I also offered to not eat on the flight). After a little bit of waiting and me looking sad, they did end up giving me a business class seat. For flights to the US, there’s a secondary security check, mostly to make you throw out your water so you go thirsty on the plane and use the bathroom less. If you really want to get water on the plane, which I find necessary for flights in coach, my strategy is to have a decoy water bottle. I place one (or more) bottles at the bottom of my bag, and I have one on the top which I throw out at the security check. Once they see me get rid of the top bottle, they usually wave me through. Anyway, at the secondary security check this time, I heard one of the security women yelling, “I will not let you bring this dangerous good on the airplane!” She was quite insistent and raising her voice. The offending item was a cigarette lighter, and the owner of said lighter said that it was an extremely expensive lighter worth over $500 USD, and he wasn’t going to get rid of it. He said that he was flying first class and couldn’t believe that he was being treated so poorly. They went back and forth a while, but the security woman had her way and they confiscated the item. This obviously upset the man, and then he started complaining about everything on the flight. Like he said that he spent $15,000 on his “first class” tickets and expected a lie-flat seat and flew lie-flat seats on the way over, but he was seated in business class, and American doesn’t fly lie-flat business class seats to anywhere in Asia except for Hong Kong. I felt bad for the flight attendants who were on the receiving end of his abuse, and I commiserated with them for having to deal with him. 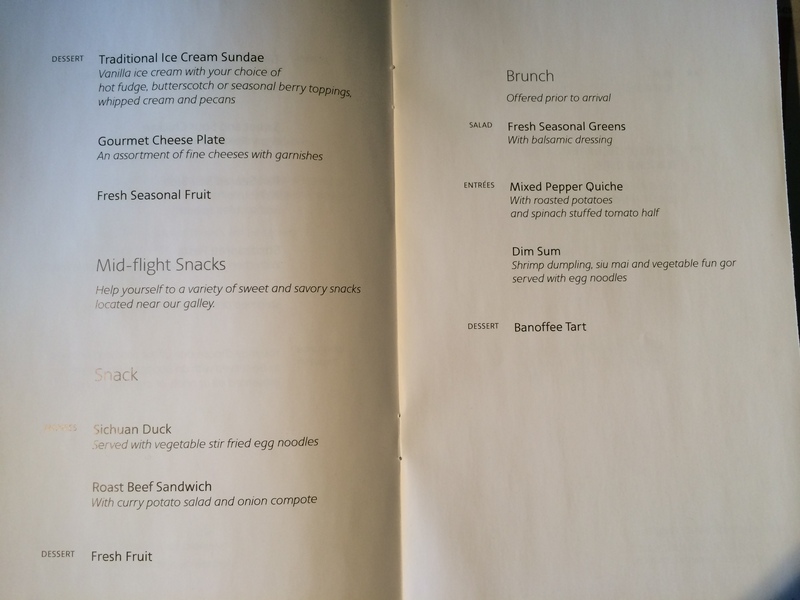 I won’t review the hard product since I’ve reviewed AA business class on the 777-200 before, but I will post the menus and pictures of the food. By far, the best part of all of the food was the banoffee tart. I’m not really sure why you don’t see banoffee more in the US, since it’s delicious. Who doesn’t like bananas, cream, and toffee The banoffee tart was clearly superior to the subpar sundae, which is totally overrated. Cheesy pasta is also overrated, as I find that airlines often just try to smother pasta dishes in cheese to obscure the poorly cooked and flavored pasta and vegetables. That being said, the food was as expected for business class on an American airline (i.e. mediocre), but I was super grateful for getting the upgrade in the first place, so I don’t want to sound like I’m complaining too much. I find AA’s business class seats on the 777-200 to be decently comfortable for a non-lie-flat seat (I like the seats better than slanty-flat seats), I like the blanket and pillows, and I appreciate that they provide slippers (one of the only business class amenities that I actually use). I’ll be glad to see business class transition to lie-flat on AA, but I think these seats are fine in the interim. This entry was posted in American, Travel, Trip Reports and tagged american airlines, business class, flight review, pvg to dfw, travel, trip report on February 1, 2015 by Edward.